VFE is able to offer a comprehensive range of Vacuum Furnace Spare Parts, backed by an ISO 9001 approved Quality Assurance System. 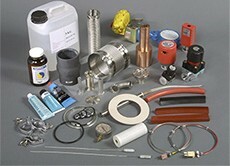 VFE stocks spares for all of the products it supplies as well as spare parts for other makes of vacuum furnace. Non- stock items are available on short delivery. Our spares support offering also includes the re-design and re-development of bespoke items. Our qualified, technical staff are on hand to offer their expertise and assistance. Contact us on +44 (0)1384 426170 for more information or to discuss your spare parts requirements.